Becca brought Jay over for a “play date” with Brian last weekend. Before the gaming commenced, the guys made us dinner. Brian picked up this garlic bread at Target. It was actually pretty good. 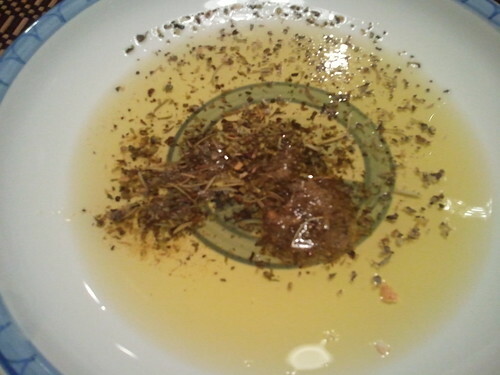 Specially since we used herbs and olive oil in lieu of plain, old butter. The Dills brought over all the ingredients and Jay did most of the cooking, which is good because he’s actually a great cook. The funny thing is that Becca immediately noticed that there was something off about the pasta when we sat down to eat. “No. It’s spaghetti,” I replied because I thought that was the plan. The guys said they were making spaghetti. Apparently the angel hair went straight into the garbage disposal due to a straining mishap. Jay wanted to save it, but Brian knew it was too late and convinced him otherwise. Good thing we had a box of spaghetti on hand. At least no one had to run back to the supermarket. Not sure what to make for dinner? Here’s an easy chicken pasta dish for all you lazy cooks out there. Brian and I love this because it’s not only easy to make, it’s cheap too! You just need pasta (Brian and I like the corkscrew kind), chicken and Italian vinaigrette salad dressing. Cook the pasta, however you normally do it. While the pasta is cooking, fry up some chicken. Once the chicken is done cooking, cut into little pieces. Drain the pasta once it is done. Add the chicken and the salad dressing. Voila! Instant dinner. Can it get any easier? 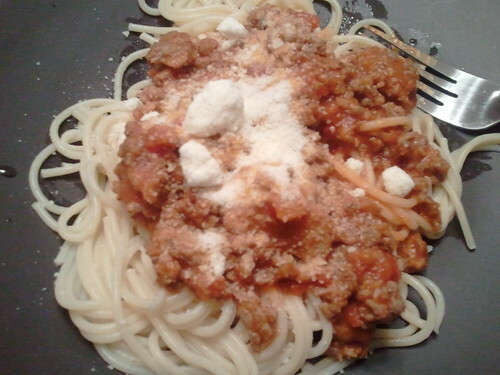 This is the cheater’s pasta dish. =P LOL. If you have finicky kids (like Brian) who don’t like veggies, you can make it just as mentioned above. If you are an adult who actually acts and eats like an adult, you can steam some veggies (like broccoli and bell peppers) and toss it in with the pasta, chicken and salad dressing. It’ll give the dish more color and texture. It looks boring otherwise. 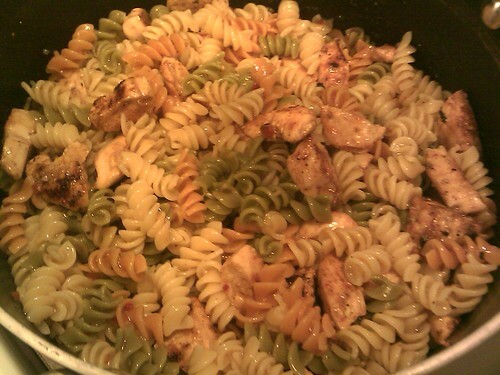 Then again, you can always use tricolor pasta in place of plain pasta just as we’ve done. That’s pretty much enough color for us because we are not fond of vegetables. Can you tell? 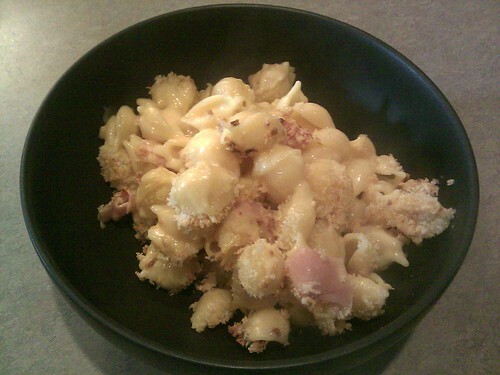 Brian made Mac ‘n Cheese tonight for dinner. It wasn’t quite right, but it was delicious! I’ll let him blog about it, though. Ron Sylvester celebrated his 50th birthday a la “Big Night” and served timpano. This is a dish I’d never had before until last night. It was mighty delicious so I thought I would share the recipe with you guys. 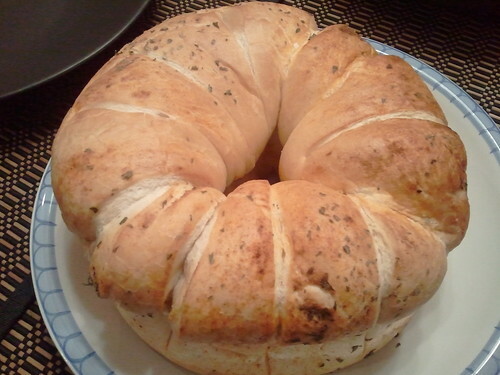 This recipe is from the web site newitalianrecipes.com and is inspired by the movie “Big Night.” Enjoy! Preparing the dough. Place the flour, eggs, salt and olive oil in a stand mixer fitted with the dough hook. Add three (3) tablespoons of water and process. Add more water, one (1) tablespoon at a time, until the mixture comes together and forms a ball. Turn the dough out onto a lightly floured surface and knead to make sure it is well mixed. Set aside to rest for five minutes. Flatten the dough out on a lightly floured surface. Dust the top of the dough with flour and roll it out, dusting with flour and flipping the dough over from time to time until it is about 1/16 inch thick and is the desired diameter. Generously grease the timpano baking pan with butter and oil. Fold the dough in half and then in half again, to form a triangle, and place it in the pan. Open the dough and arrange it in the pan, gently pressing it against the bottom and the sides, draping the extra dough over the sides. Set aside. Preparing the filling. Have the salami, provolone, hard-boiled eggs, meatballs, and tomato sauce at room temperature. Toss the drained pasta with the olive oil and two (2) cups of the tomato sauce. Distribute six (6) generous cups of the pasta on the bottom of the timpano. Top with one (1) cup of the salami, one (1) cup of the provolone, six (6) of the hard-boiled eggs, one (1) cup of the meatballs, and 1/3 cup of the Romano cheese. 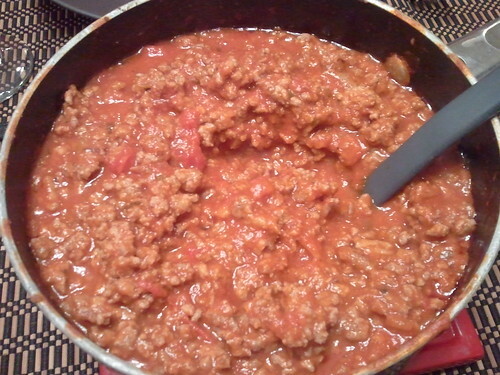 Pour two (2) cups of the ragu (tomato and meat sauce) over these ingredients. Top with six (6) cups of the remaining pasta. Top that with the remaining one (1) cup of salami, one (1) cup meatballs, and 1/3 cup Romano cheese. Pour two (2) cups of the ragu over these ingredients. The ingredients should now be about one inch below the rim of the pot. Spoon the remaining ragu over the pasta. Pour the beaten eggs over the filling. Fold the pasta dough over the filling to seal completely. Trim away and discard any double layers of dough. Bake until lightly browned, about one hour. Then cover with aluminum foil and continue baking until the timpano is cooked through and the dough is golden brown (the internal temperature will be 120° F), about 30 minutes. Remove from the oven and allow to rest for 30 minutes or more. The baked timpano should not adhere to the pan. If any part is still attached, carefully detach with a knife. Grasp the pan firmly and invert the timpano onto a serving platter. Remove the pan and allow the timpano to cool for 20 minutes. Using a long, sharp knife, cut a circle about 3 inches in diameter in the center of the timpano, making sure to cut all the way through to the bottom. then slice the timpano as you would a pie into individual portions, leaving the center circle as a support for the remaining pieces. Fazoli’s is growing on me.. Or maybe I’m just growing? Perhaps that’s what will eventually happen to me if I continue eating there. LOL. By the time we got around to going to Fazoli’s, the coupon on the web site had changed. Instead of free spag with drink purchase, they now had free spag with small spag purchase. Still a pretty good deal, but not as good as the original deal. I mean, come on. Where else could you eat for $1.69? With the new coupon, we were looking at spending $4.00 for the small spag plus $1.69 for the drink (Brian and I will usually just share one at fast food places) so about $6.00 for dinner. Still not bad, but you all know me. I’m frugal. As we were having our cheapie dinner, Brian had this brilliant thought that next time we come across a good deal like this we should print a bunch of these coupons and give them out at the homeless shelters. I added that we should also give them at least a couple of bucks along with the coupons that way they won’t have to come up the money themselves. So Brian and I decided that if we ever win the lottery, we are handing out money and Fazoli’s coupons to the needy. I told him that I would have to write it down so we’ll remember. We are so weird.